Hand written graphs where the supervisor has to record performance as red for off target or green for on target are much more effective than computer screens or dashboards where the leader is just a passive observer of the data. Imagine a sport where the score was unknown until two weeks after the game, was often inaccurate and the players were never told the score. Such a sport would not have many fans. Unfortunately many businesses run this way. Financial results are generated weeks or months late and are often inaccurate. Factors driving business metrics are often not well understood and sometimes not measured at all. Even if performance is measured it is often not shared with front line employees. So what should you measure in your business and how should you measure it? With business metrics the temptation is often to measure everything. In our experience it is best to start with just one or two measures for each of safety, quality and output. Choose simple easily understood measures. Measures that involve counting are usually easier to measure and understand than percentages or ratios. Unit output versus target or takt time is often the first measure that is established. For safety and quality, in the absence of better metrics, we often use a simple red or green indicator to highlight whether there has been an issue today or not. The next measures may well be the key things that impact achieving targets such as hours of unplanned downtime, rework, near misses or number of defects. We also think that measures should be recorded by hand in the workplace by the people engaged in the work rather than producing elegant computer graphics in an office. This ensures that the people who are most able to make a difference to performance see themselves as accountable for that performance. Aim to measure as frequently as you can. Measuring your process hourly means that you can detect problems fast and react quickly, minimizing the consequence if you fall behind target. 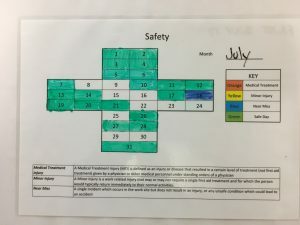 This very simple daily chart records if a safety issue has occured the previous day and prompts a daily discussion of safety. Most business measure trailing indicators. These are measures such as profit or return on assets that record the past performance of the business. This is a bit like the score in a game of football. However to improve in sport you need to look at the factors that drive the overall score. 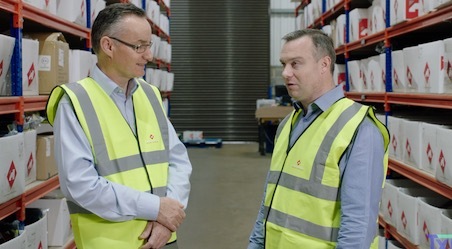 In football this might mean tracking the number of kicks or unforced errors, while in business, internal quality defects (or right first time) is often a driver of quality, while the number of out of stock items is a good predictor of on time delivery. You will also find it hard to meet customer lead time goals unless your internal production lead time is kept below the lead time your customers expect. A sports team will use its scores and its statistics as a basis for improvement, focusing training on the areas where performance is not meeting targets. Likewise in business, measuring KPIs goes hand in hand with a process of problem solving and continuous improvement. We find that a ten minute meeting every day is often all that is needed to review performance and find and address the root causes of problems. The measures then provide feedback on the success of your problem solving efforts, completing the plan-do-check-cycle. A new calendar year is a great time to start measuring your business, so start today and choose one or two key measures that will drive your business to higher performance.